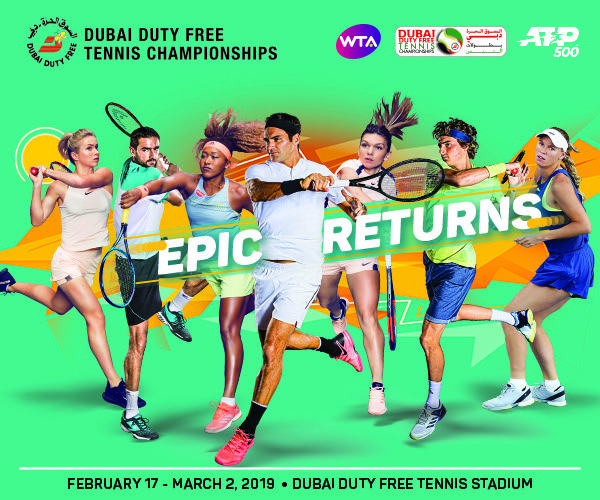 Follow the results of men's singles quarter-finals action at the 2018 Dubai Duty Free Tennis Championships. Malek Jaziri will face third seed Roberto Bautista Agut in the semi-finals of the Dubai Duty Free Tennis Championships on Friday after defeating fellow wild card Stefanos Tsitsipas 6-4 3-6 6-3 and Bautista Agut beat Borna Coric 7-6 (4) 6-4. Only one break for 2-1 decided the first set in Jaziri’s favour, and he had an opportunity to break again for 3-2 in the second set but netted his return. Tsitsipas then broke to lead 4-2 with a return of his own and had a break point to lead 1-0 in the third set before Jaziri broke for 4-2. This is the 34-year-old’s third semi-final on the ATP World Tour, and the first at the ATP World Tour 500 level. “It’s a great feeling,” Jaziri told the crowd on court after the match. “I am playing the best tennis of my life. Malek Jaziri kisses Centre Court to celebrate his win over Stefanos Tsitsipas in the Dubai Duty Free Tennis Championships quarter-finals on Thursday. Bautista Agut is into his first Dubai semi-final and his first since he went on to win Auckland in January. Coric had begun his previous matches this week in style, and although Bautista Agut at first held him at bay by winning the opening game at love and then holding two break points on the Coric serve, the Croatian quickly gained the advantage, broke for 2-1 and then held his next two service games at love. Bautista though managed to level the set at 4-4 by breaking Coric and then edged the tiebreak. Both players had a break point in the second set before Bautista Agut gained the decisive break at love to lead 5-4.